This push puppet was made back in the 1970s for Gabriel. 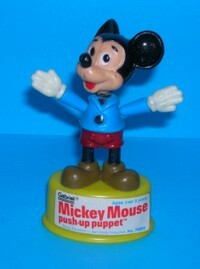 Mickey Mouse is made from plastic and is called a Push-Up Puppet. Overall condition is good. He stands flat on a surface and the label is bright and stil readable. There is, however, a stray blob of black paint under his chin - nothing too serious though.